Border Terrier Dogs - A Border Terrier is a small, rough-coated breed of dog of the terrier group. The Border Terrier has a double coat consisting of a soft undercoat and harsh, wiry outer coat. The coat type of a Border has a lot of variation across individual dogs, some develop longish, shaggy hair and others never go on to develop a full coat and remain relatively smooth in coat. Border Terriers are friendly, smart, energetic and playful. They can make good family pets as they are generally good with children. If their owners cannot give them a lot of attention, they are best kept with other dogs of similar temperament. 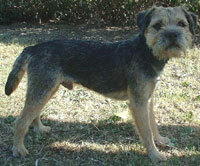 Border Terrier Breeders - Advertise your kennel puppies and dogs here.